This form is designed to subordinate a hotel or resort management agreement to the lien of the financing for the property. The lender usually will require this subordination to avoid any conflict between the loan for the property and rights and remedies under the management agreement providing for the marketing and operation of the resort or hotel. Other Features Application of Funds Provisions, Foreclosure Provisions in Favor of the Lender, Notice and Rights to Cure Defaults Under the Management Agreement in Favor of the Lender, Rights of the Lender to Modify Loan Provisions Without the Need For Consent by the Manager, No Impairment Clause, etc. This ASSIGNMENT, CONSENT, SUBORDINATION AND NONDISTURBANCE AGREEMENT (this “Agreement”) is made and entered as of this ____ day of _______, 20___ (the “Effective Date”), by and among PROPERTY OWNER, a _________(“Owner”), (ii) COMMERCIAL LENDER, a _____________ (the “Lender”) and (iii) GENERIC MANAGEMENT COMPANY, a _____________ (“Manager”). A. Manager has entered into a Management Agreement dated as of _________, 20___ (the “Management Agreement”) with Owner, regarding the management and marketing of the resort currently known as the _________ Resort, located near _________, _________, and more fully described in the Management Agreement (the “Resort”). The legal description of the real property on which the Resort is located is set forth on Exhibit A hereto. B. Lender acknowledges its receipt of a duly executed copy of the Management Agreement. D. Manager and Lender desire to provide that any interest in the Resort created by the Management Agreement is subordinate and subject to the Mortgage, to provide for Manager’s continued management of the Resort pursuant to the Management Agreement in the event of a transfer of ownership of the Resort on foreclosure of the Mortgage or a conveyance in lieu of foreclosure and to give Lender certain rights respecting Manager’s obligations under the Management Agreement. 1. Recitals Part of Agreement. The Recitals form a part of this Agreement and are fully incorporated herein by this reference. Any capitalized terms not otherwise specified or defined herein shall have the meanings set forth in the Management Agreement. 2. Security Interests; No Impairment of Lender’s Rights. Manager acknowledges the security interests granted to Lender as set forth in the Security Agreement attached hereto as Exhibit C. Manager agrees, for the benefit of Lender, that upon its receipt (the “Receipt Date”) of a written notice from Lender stating that an Event of Default (as defined in Mortgage) has occurred and is continuing under the Mortgage and that the obligations owing by Owner to Lender have been accelerated, Manager shall not apply the Funds (as defined in Section 3 below) to or otherwise make any loans or payments of any kind or nature to Owner or any affiliate of Owner until the applicable Event of Default is cured or waived in writing by Lender in each instance. 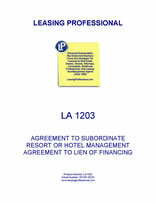 The foregoing shall not be interpreted to prevent Manager from paying the management fees under the Management Agreement or from paying bills properly incurred in connection with its operation of the Resort from operating accounts as the same become due and payable, or disbursing reserve funds for the purposes intended in the creation of the reserve, but only pursuant to and subject to the terms of the Management Agreement. This Agreement shall not be deemed to impair or to constitute a condition precedent to the exercise by Lender of any of Lender’s rights against Owner and/or Manager under this Agreement which are not expressly conditioned upon the existence of a default under this Agreement or an Event of Default under the Mortgage. Owner hereby acknowledges its consent to the foregoing and releases Manager from any liability arising out of any action or inaction by Manager which was based on the direction of Lender and undertaken in good faith by Manager. 3.2 If the Funds are insufficient to cover all of Owner’s or Manager’s obligations under the Management Agreement, Manager shall apply the Funds in accordance with the terms of the Management Agreement and not otherwise.